The Odinic Rite is an international organisation dedicated to the advancement of Odinism, a modern day expression of the ancient indigenous beliefs of our Northern Indo-European ancestors. Drawing on ancestral wisdom from the dawn of our folk, The Odinic Rite is a unique denomination of Odinism. We do not consider the Viking age to be the golden age of our people, but a part of the rich tapestry which contributes to our history and wisdom. 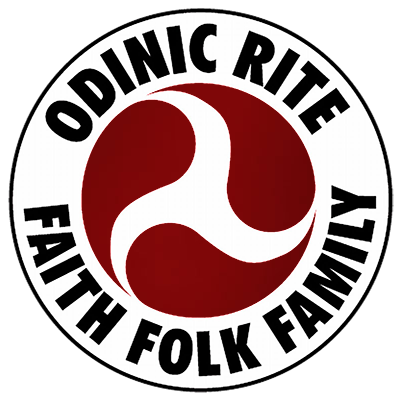 The Odinic Rite offers a home to those looking to reconnect with that history and wisdom and the opportunity to learn, grow and evolve both personally and spiritually amongst like-minded folk. When was the Odinic Rite formed? The Odinic Rite was founded in London, England in April 1973 by John Gibbs-Bailey (aka Hoskuld) who had been an Odinist since before WWII and John Yeowell (aka Stubba). The group was was initially called ‘The London Committee For the Restoration of the Odinic Rite’ but the name was unwieldy and so was generally shortened to ‘The Odinist Committee’ and then finalised in 1980 as the Odinic Rite. The blue print for the organisation’s structure and aims was influenced greatly by Hoskuld, who brought decades of Odinic practice to the new organisation, so while the name was new, in a way it was a continuation of something which had been forming since the 1930s. What are the aims of the Odinic Rite? The Odinic Rite is an organization whose aims are to promote all aspects of our ancestral religion today called Odinism, the organic spiritual beliefs and way of life of the indigenous peoples of Northern Europe. The watch-words of the Odinic Rite are “Faith, Folk, Family” and this summarizes our ideals well. Odinism is an entire and whole system – a way of “being”. It is concerned with all aspects of our folk – cultural, historical, ecological, mystical etc. etc. It is concerned with the ethics of social behavior, our relationships with one another and nature, with the whole of life. Odinism defines our unique identity as a folk and as individuals within that folk organism. Odinists believe they cannot properly respect other folk until they can respect themselves. Odinism is seen not only as a link with the past, but as a strength for the present and a desire for a noble future. As the Odinic religion is seen as a way of life – our inherited culture – Odinists feel they have a duty to pass it on to their children and to encourage their country men and women to find their own path. As our inspiration, we try to learn from it and we seek to protect it, defend it, preserve it, advance and extend it, to bring about the New Awakening. How is the OR structured? The OR’s governing body is the Court of Gothar who are themselves advised by officers who make up the OR Information Committee. Regionally we have groups called hearths and members are encouraged to join their local hearth if there is one or to work towards building one if there is not. It should be stressed that the OR is not a loose alliance of like-minded folk but a structured and disciplined group. This does not suit some people but those who join the OR should understand that our achievements and our stability have been facilitated by the way we are structured. How is the Rite organized locally? Each individual member of the Rite is important and is regarded as a living cell of the living community of the Odinic Rite. Where possible, groups of members are encouraged to meet together, often at a member’s home or a local site, to conduct Odinist celebrations (known as Blots). These small local groups are known as Hearths. Social contact is regarded as an important part of Odinism, as Odinism is a way of life, not a part-time hobby. The Hearth provides a circle in which the individual and group can learn from each other, help each other, cement comradeship etc. and in so doing benefit not just themselves but the community of the Odinic Rite as a whole. Hearths initiate and run various projects of benefit to the Odinist movement and have a high degree of autonomy, whilst still respecting the OR. 1. The Hearth Guardian must be a professed member of the OR. 2. The Guardian and at least two other members of the Hearth must contribute to the Rite by annual donation. Thus a whole family could form a Hearth – this is encouraged. Once these criteria are met, the Hearth is likely to be recognized as an official Hearth of the Odinic Rite and can use the initials OR to indicate this – for example, Odin’s Hearth OR. The Hearth is a self-supporting unit and raises funds for its projects, its upkeep and the obtaining of regalia from within its ranks. There is nothing to prevent an Apprentice forming an Apprentice Hearth (called a Hearth AOR) with the intention of it becoming an official Hearth OR in time. (The OR supplies a booklet further detailing how to form and run a Hearth of the Odinic Rite – this is sent out to members by request). Who runs the Odinic Rite? The Rite is run entirely by unpaid volunteers who devote their time, energy and effort in the service of the Odinist community and the High Gods. The Odinic Rite is governed by the Court of Gothar who are advised and assisted in the day to day running of the OR by various officers with skills in particular areas. All members are encouraged to assist in helping the OR to run smoothly. How is the Rite financed? Our funds come primarily from the annual membership subscriptions paid by our members (this can be paid quarterly after 1st year) which is considered as the minimum level of donation. Some members choose to set up additional regular or occasional donations. We also receive funds from the sale of goods via the OR store and events such as the auction at our annual Great Moot. The Rite is a completely self-supporting community in that without the financial support of its members it could not exist. Members believe that by supporting the Rite – their community – they also support themselves as individuals within the community. Does the Odinic Rite take a political viewpoint? The Odinic Rite is not a political movement – a member’s political outlook, if any, is up to them as free people. This does not mean members cannot comment on matters which affect us all. Indeed individual members would be abrogating their civic duty if they neglected or ignored the ethical matters that are constantly being discussed in the wider community. But although it is expected of members that they apply Odinist principles in all endeavors, they involve themselves in political activity as private individuals not as representatives of the Odinic Rite. How are men and women viewed in the OR and Odinism as a whole? Whilst men and women are each powerful in their own right, balanced cooperation will actually enhance and deepen those inherent forces which create, sustain and evolve life. Thus, by proudly working to restore the true and holy nature of the male/female polarities in proper relationship to each other, so our folk will be restored to their rightful strength. This is Natural Law and as an expression of such, Odinism- and hence the Odinic Rite- hold this balance of polarity (i.e. both men and women) as equally sacred sustainers of the whole. What is the meaning of the OR logo? The triskel is a very ancient symbol and there are many differing views about its meaning. To Odinists the number 3 is a holy number and it can be seen throughout our mythology. It is also the square root of 9, another very important number. It represents completeness and can signify the union of two opposite forces giving rise to a third. On one level this could be seen as signifying the family – the father and mother whose union gives birth to the child yet, as with so much in Odinism, it can be viewed and understood on many levels. The specific triskel symbol used by the OR today, along with the Faith, Folk and Family motto (another 3!) first appeared on the back page of ORBriefing number 112 in October 1991. The design of the black OR triskel on a red background creates 3 blood drops which is wonderfully symbolic of Faith, Folk and Family, things to which we are linked by blood. How do I join the Odinic Rite? Please go to the Joining Info page of our web site and you will be shown all of the joining options available. Membership is payable upon application via an annual Paypal subscription and continued membership is reliant upon a current subscription. After the first year of membership this may be changed to a quarterly payment. The Paypal subscription method is used as it reduces the admin required of our busy volunteer staff. If the subscription is cancelled or expires without any notification from the member then we will be notified by Paypal and the membership is considered to have been cancelled. Any member who can not pay their subscription or any reason but does not wish to be considered as having left the OR should contact their regional officer as soon as possible. There are many benefits that come with membership of the world’s longest running, continually active Odinist movement. Some can be easily named as below but others must be experienced and will vary depending on the individual. On acceptance of a member’s application they will receive their first copy of ORBriefing, the members’ quarterly e-journal and Rimstock, a directory detailing the OR festivals, events and contact information. Members may also added to the OR’s online discussion forum, a virtual community bringing together members from around the world. The forum is a place where all kinds of subjects relating to the OR and Odinism are discussed and gatherings, events etc. are planned. Most of all what you get is the membership and support of the OR community, a family of dedicated people who work for the new awakening of our folk. We believe that what you get out of OR membership is directly proportionate to what you are prepared to put in. The OR is like a living organism which relies on its members to thrive and grow. What is Apprentice Membership of the Odinic Rite? Apprentice membership is open to all (subject to approval of application) who feel an interest in the Odinic Rite and in accord with our folkish Odinist principles. The term stems from our very early days and all members begin as an apprentice of the Odinic Rite (AOR) and will remain so until they take the Oath of Profession, if they choose to do so. There is no pressure on anyone to become professed; it is a personal choice. Many of the Rite’s most active members are apprentices and they are valued as much as any other member. Apprentices may use the initials AOR after their name if they so choose. This is not a requirement but many choose to show their loyalty to the OR in this way. The ceremony of profession confirms before the Gods and men a person’s restoration to their true indigenous faith and their dedication to the Rite. They become full members of the Odinic Rite, Odin’s Holy Nation. It is not a step to be taken frivolously, for it is a very holy ceremony where irrevocable oaths are sworn. The act of profession is irrevocable by the individual: although we speak of “members” of the Odinic Rite, it is not possible to “resign” as though it were a club. The Odinic Rite is regarded as a folk community, the Nation of Odin. Once professed, the oaths taken always apply. 3. Find another already professed member to “sponsor” them. 4. Find an already professed member to conduct the ritual of profession. 6. Make a “torc”* (to be invested during the ritual) which is the symbol of the professed member – their “badge” of honor. A professed member uses the initials OR after their name. (note: members of the Court of Gothar use the initials CG after their name). *Over the years the OR “torc” has evolved into a gorget design. It must be made of a natural material with metal being most common but wood and leather have also been used. What about geographically isolated members? The OR has many geographically isolated members. We have a network of area contacts who will strive to put isolated members in contact with others or keep in contact themselves. We encourage isolated members to do their best to meet with members nearest to them and this has brought about the formation of Hearths whose members, whilst fairly dispersed, have a greater sense of belonging and comradeship. They may only meet a few times a year but those meetings are very special times. The OR members’ forum is an ideal resource for isolated members allowing them to become involved with the wider OR and to make plans to meet others and attend events and gatherings. Are there any OR Hearths or members in my area? People often ask, “are there members/hearths in my area?” Well the simple answer for anyone who joins will be yes, you! And for a while you may be the only one, but you will not be alone. The OR is about building to advance Odinism. If there are no members or hearths in your area then you have a choice to make. Will you walk away? Or will you be the first and become the beacon that guides others. As Odinists we should not wait for others to build something before deciding to get involved, we should be the builders. Joining the OR gives you access to a community and to many people who started out where you are now; solitary, looking for answers and the comradeship of fellow Odinists. Time and again we see in areas where previously there were no members, a motivated and active individual joins us and before long there is a hearth in that area. That is the OR way. Then the next time someone asks “are there members in this area” we can say “yes!” and send them your way. Can I belong to the OR as well as other Odinist/Asatru organisations? The OR does not encourage multiple memberships of organisations as we believe that this dilutes any potential energy available for the advancement of the OR. Whilst we may allow members of other organisations to join the OR we would expect that their first loyalty be to the OR. Those who are oathed to another group will not be accepted for OR membership as their first loyalty must be to that group. Does the OR accept prisoners as members? Yes, we believe that incarcerated Odinists, most of whom discover Odinism whilst in prison, should be supported in their faith and given the same rights to practice their holy religion as those of other faiths. We recognise that one day these people will be released into our communities and so it is in all of our interests to aid them in their quest to live a nobler life through Odinism. The vast majority of Odinist inmates accept that they did wrong and must serve their time. They know that Odinists must take responsibility for their own actions and face the consequences. We do not extend our support to or accept as members those convicted of sexual offences or of offences against children. They are the moral and ethical codes by which OR members strive to live. They were codified at the formation of the OR in 1973 and have been adopted ever since by many individuals and groups or provided the outline from which others have created similar codes. Some members, particularly Professed members or those holding official positions within the OR, choose to adopt an Odinic name for use within the Rite. For some it marks more clearly their restoration to the Odinic faith, while others do not wish to be known by names which are not native to the folk or are related to Christianity. Still others wish to retain the names given to them by their parents. It is a matter of personal choice. We urge anyone wishing to take an Odinic name to consider seriously and solemnly before choosing as it is not something to take lightly. Why are the Runes so important? Study of the runes is encouraged in Odinism. It should be remembered that the runes are far more than a divination system as is so often portrayed. Moreover they are a part of the Odinic system and the Odinic system alone. Attempts to merge or fit them to other systems, e.g.the Qabbalah, is pointless and will not lead to any deep understanding of our Runic system – though it may and often does lead to self-delusion. On the other hand, those who believe that runes and runology are the be-all-and-end-all of Odinism have too narrow a vision of the runes, a shallow knowledge of their mysteries and a lack of understanding of the meaning of religion. The runes are the essential mystical ingredient of Odinism but not its sum total. Does the OR have a prisoner outreach program? Initially the Odinic Rite set up an outreach program but it soon became clear that “Outreach” did not adequately describe the work we were doing so the “Prison Affairs Bureau” was created and it now oversees all OR prison activities. Outreach is still a major part of our activities but also the PAB is involved with campaigns for religious rights and also acts in a consultative capacity to prison and federal authorities. The PAB also operates book/DVD drives when contributions of such items allow, ensuring that our incarcerated members have access to faith related materials in line with other religions. Our goal is to provide relevant information and to provide spiritual and emotional tools so men and women who chose Odinism can become responsible for their actions, deal with prison life and eventually re-enter society with an eye on positive contribution and balanced lives. Ultimately we are practical minded, with an interest in applying Odinism to modern challenges. Please see our PAB page for more information.